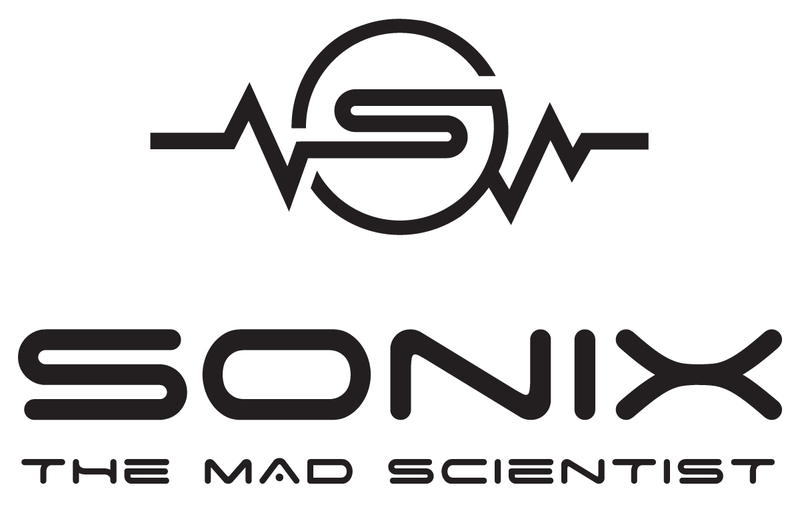 Sonix “The Mad Scientist” has been forging his imprint on the music scene since the mid-1990’s. He has also had numerous incarnations. Once known professionally as Timar, at times also known as Soniq, he was a Staff Producer/Engineer/Song-Writer and A&R for Sure Time/Capital Records. To date, Sonix’s outstanding production and musical abilities have given him the opportunity to work with following Record Labels; Atlantic Records, Bad Boy Entertainment, Capital Records, Columbia Records, Def Jam Records, East West Records, Jive Records, Sony Records, Virgin Records, and Warner Brother Records, and award-winning, ground-breaking Artists such as David Bowie, Danity Kane, Sean “P-Diddy” Combs, 50 Cent, DMC (Run-DMC), Barry White, Tony Terry, F.S. Effect, Christopher Williams, Intro, Sweet Sensation, Maxi Priest, Loon, Mario Winans, Carl Thomas, Cheri Dennis, Da-Band, Sebastian Bach (Skid Row), Travis Barker (Blink-182), Mick Mars (Motley Crue); and international phenomenon’s Youssou N’Dour, Spearhead, Zap Mama, Toots & The Maytals, Nalini, Toshinori Yonekura, and Daddy Nutty among many others. Respected beyond the genres of Urban and Hip-Hop music, Sonix’s musical influences cross a multitude of cultural lines. He is sought by a diverse array of superstars for his creativity and strength as a producer. Sonix is gifted at designing a musical soundscape that highlights the best qualities of an artist, while bringing that artist into the future of their own sound. At the early age of three, Sonix learned to play the drums and various percussion instruments at his Father’s church. By age seven, he took on the bass guitar. By age thirteen Sonix was actively touring as a drummer for a gospel supergroup. He soon began studying synthesizers, drum machines, organ, and what would become his main instrument, the piano. Throughout high school, he regularly participated in talent shows, Chorus, Jazz Band, Marching Band, and Football. During this time, an English teacher introduced Sonix to poetry where he began fusing his love for music with a newly found talent for poetry. His songwriting was then born. By the age of fifteen he learned how to record vocals and instruments with a recorder his father had given him. A year later, his cousin Al came to live with he and his family in Connecticut. Al, an aspiring musician and artist as well, was studying Recording Engineering at CMA (The Center For Media Arts) in New York City, and would share his school lessons and experiences with Sonix. The two spent countless hours perfecting their craft recording song after song. Al soon signed a major recording contract with Warner Brother Records and became known to the world as Grammy-Award winning Al B. Sure! Sonix went on to graduate J. A. Foran High School in Milford, CT and continued his education at The Hartford Camarata Music Conservatory. There he formally studied Jazz, Piano, Song Composition, and Music Theory. Sonix progressed and gained respect working with Local, National and International Gospel, R&B, Pop, Hip-Hop, Rock, and Reggae artists as a Producer, Musician, Musical Director, Songwriter, Arranger, Programmer and Engineer. His knowledge in engineering became extensive at various world-renown recording studios such as Power Play, Giant, Quad, Chung King, Unique, The Hit Factory, Platinum Island, Sony and The Power Station where he produced countless projects for both independent and major label projects. As a professional touring musician and musical director, Sonix performed on Jay Leno’s Late Show, BET, MTV, The Arsenio Hall Show, The Apollo stage, and at arenas, coliseums, colleges, schools, and churches around the globe. As a Producer and Engineer, Sonix uses various work stations, sequencers, drum machines, keyboards, synthesizers, virtual synths, Fender Rhodes and B3 organ; As well as, acoustic pianos, drums, bass, guitar, and percussion instruments. He Mixes and Records in both Digital and Analogue domains, with the use of Pro Tools, Waves, SSL, API, Sound Toys, Serato, Melodyne, Antares Audio, Xpand, Spectrasonic, Reason, and Logic Software, along with SSL, Neve, and Avid/Digidesign Consoles. The Roland Fantom, Akai MPC-3000, Akai Renaissance, Yamaha Motif XF, Korg Triton, Korg Oasis, Korg Kronos, Nord Electro 4, Nord Stage, Fender Rhodes, Hammond, Moog, Vintage Vibe Custom Pianos and Apple Computers are some of his favorites. Sonix is the President and founder of Nucleus Entertainment, Inc a Multi Media Production Company, where he produces major recording projects, develops new talent and new opportunities to expand the Nucleus brand. Sonix is currently in the process of completing his first Producer’s album, “Reloaded”, with a multitude of specially invited guests including DJ Ashba (Guns & Roses, Motley Crue), Mick Mars (Motley Crue), DMC (Run-DMC), Boogie Black, Talib Kweli, Maya Azucena, Busta Rhymes, Tony Terry, Latice Crawford, Sebastian Bach (Skid Row), New Breed, Logik Ventura, Kandyman The King Pin, The Fly Boiz and others. Looking forward, he has plans to venture into more soundtrack production in 2014. MUSICIAN AND MUSIC PRODUCER WHO TRANSCENDS A MULTITUDE OF MUSICAL GENRES. “My music and inspiration comes from God. He lives in me and he has blessed me with an abundance of talent, skill and know-how, which he unlocked in me through diligent work and time. There is a well of music in my soul and I draw from that well when I create. I am an extension of that connection to the well and it pours out of me through my fingers and hands. He fills that well and me with the talent but he leaves it up to me to do what’s right with the gift. He allows me in a sense to manage it but I have to be a good steward and custodian with all of his blessings or the sun will not shine over me and it would be the end of my existence in the well of his goodness.